Yes, this is the mitten state. 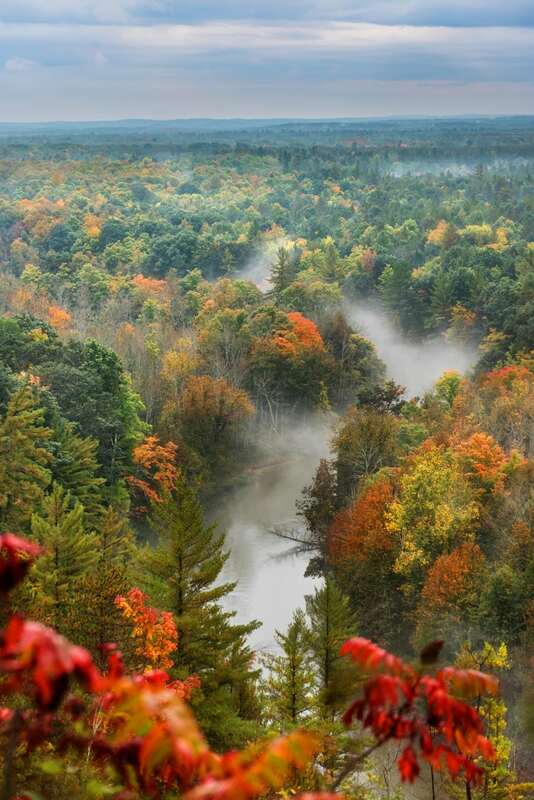 Head on a gorgeous, pinch-me-I’m-dreaming Michigan color tour across the forest and waters (and waterfalls!) of our special place on earth. 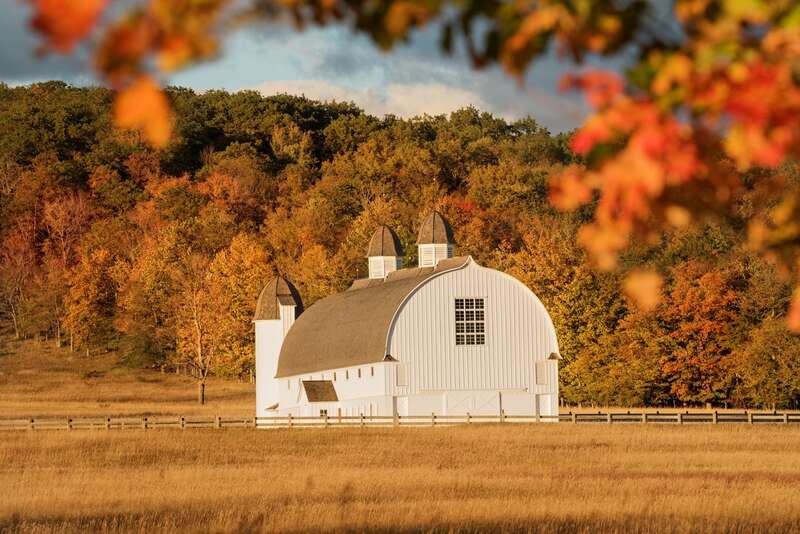 These are Up North’s best fall views and how to enjoy them to their fullest. This story is featured in the October 2018 issue of Traverse, Northern Michigan’s Magazine. Get your copy. Get There: The Lake Ann Road Parking Area has barrier-free parking and restrooms, and a universally accessible trail along Ransom Creek to a deck overlooking the lake. There is a second access point and parking lot off Bellows Lake Road and 1.8 miles of trails. *Hunting is allowed at the natural area. Wear bright colors. Don’t Miss: Grab a gourmet pizza at Stone Oven on First Street then mosey next door to Lake Ann Brewing for a craft beer or cider (or go straight for a cold one—Stone Oven will deliver to you). Catching a fall color sunrise? The Red Door Coffee House serves breakfast, pastries and espresso. 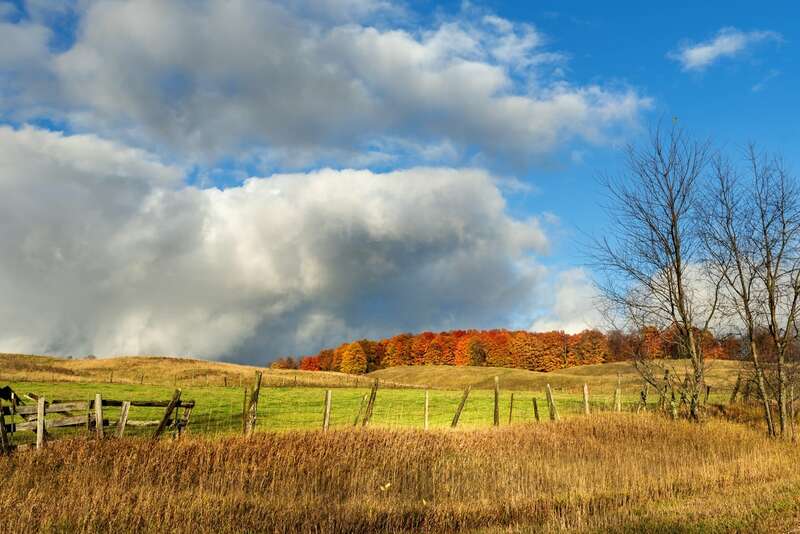 Take your goodies down the road to Almira Township Lakefront Park for a picnic by Lake Ann. Get There: Park at Chapel Basin Parking Lot. You’ll be hiking out to the point. 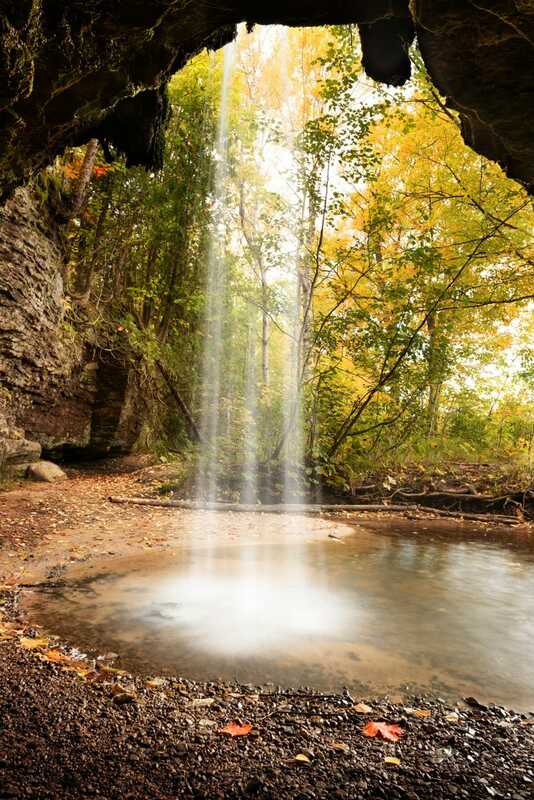 The 10-mile Chapel Loop will take you past Chapel Falls and Chapel Beach before Grand Portal Point, the halfway mark. Choose to add on 3.4 miles round-trip to see Spray Falls and 1.4 miles to get to Mosquito Falls. Use this map. Don’t Miss: See Grand Portal Point from the water with Pictured Rocks Cruises. Tours run through mid-October and often sell out so pre-purchase your tickets. Fares range from $38 (classic and sunset cruises) to $45 (Spray Falls cruise). Children ages 6–12 cost $10 and children under 6 cost $1. Do This: Visit the Alger County Heritage Center. Exhibits feature Grand Island, the Munising Woodenware Company, barn building, homemaking, and sauna—a Yooper ritual. A fur trader’s cabin and blacksmith shop are also on site. Open Tuesday–Saturday, noon to 3 p.m.
Get There: From the base of Old Mission, head north for about a half-mile on Peninsula Drive. Stay right onto M-37 (Center Road) and drive 12 miles. Chateau Chantal will be on the right on Rue de Vin. If it’s warm out, enjoy a glass of wine on the back patio, but be sure to see the view of Power Island and West Grand Traverse Bay from the front yard. Don’t Miss: Old Mission Flowers is a self-serve garden with hundreds of varieties. The garden is open daily from dawn to dusk through October. Containers, water, flower preservative, and scissors are available, and the flowers are sold on an honor system with prices ranging from $.50 to $5 a stem. Bring cash or check (16550 Center Rd.). Watch for farm stands as you’re driving the peninsula for seasonal produce, baked goods, honey, and more. Cherry Capital Farm Market is the oldest in Grand Traverse County (14325 Center Rd.). 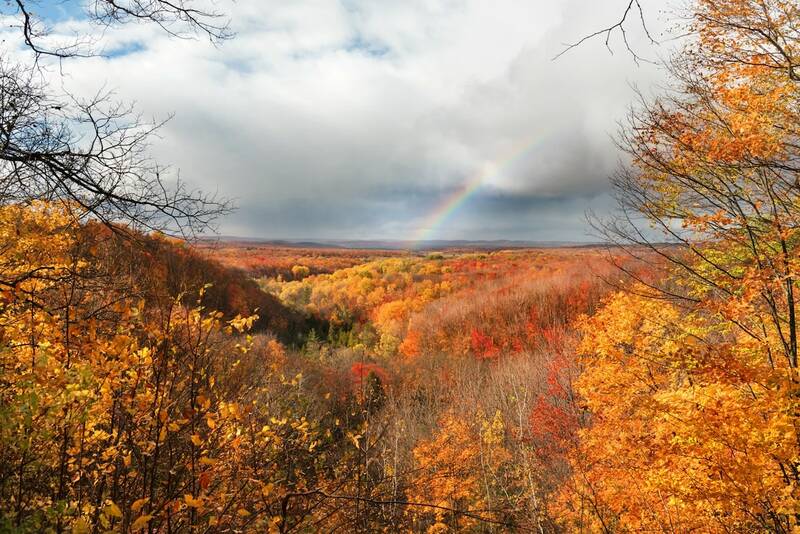 Get There: From Munising, travel 10 miles west on M-28. The H.J. Rathfoot Roadside Park will be on the right—park here—with restrooms, picnic tables, charcoal grills, and beach access. The falls are across the highway. Walk behind the falls for a fantastic photo op. Don’t Miss: The “Face in the Rock” at the roadside park. The stone carving was done by a French voyager in 1820 as a tribute to Powers of the Air, the sole survivor of the Chippewa tribe who lived on Grand Island before a bloody battle with the Sioux. Plaques along the wooden boardwalk tell the full story. 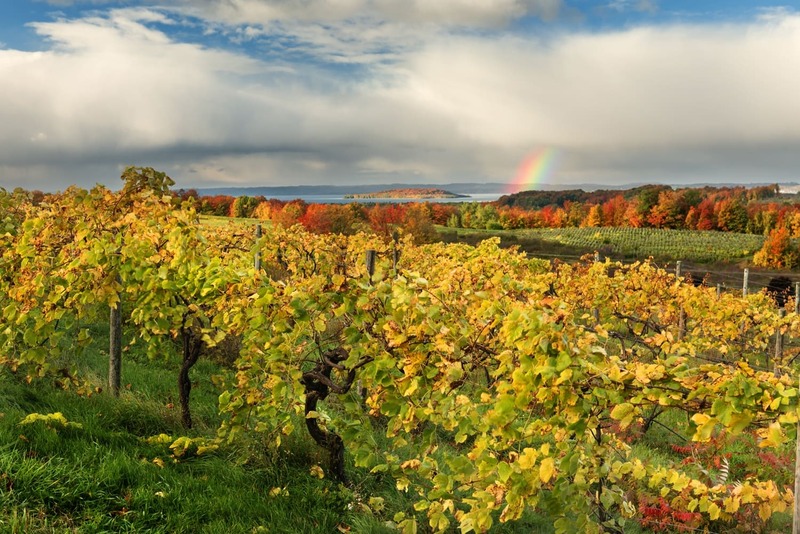 Get There: Located about 11 miles southeast of downtown Traverse City. Take South Garfield Road to Brown Bridge Road. The parking area is on the left before you reach Wadsworth Road. 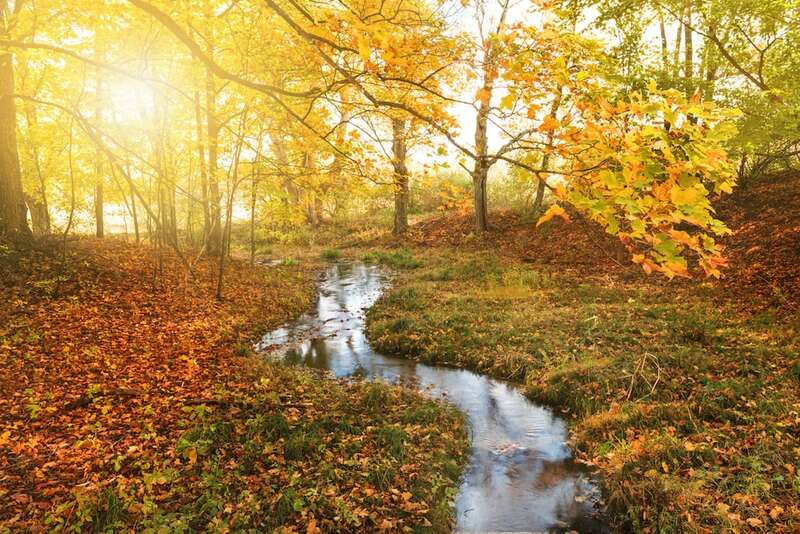 Explore 6 miles of hiking trails and several overlooks of the Boardman River. You can also access the quiet area off Ranch Rudolf Road. *Deer hunting is allowed outside the core area and on the far east section. Wear bright colors. Don’t Miss: Don’s Drive-In looks the same as it did in 1958. Order a burger and milkshake or warm up with a bowl of chili. Do This: Go on a horseback riding tour at Ranch Rudolf. Trail rides are generally offered through the third week in October, but call ahead for availability. Choose a one- or two-hour ride, or a 15-minute “buckaroo” adventure for children ages 3–7. Not in full giddyup mode? Take a scenic 45-minute hayride through the Boardman River Valley courtesy of Prince and Monte, the ranch’s Belgian horses. Get There: From downtown Buckley, take East Wexford Avenue 1 mile to N 17 Road. Hang a right and drive a half-mile to W 4 Road. Continue 4 miles. Stay on W 4 Road when it becomes dirt. Follow the North Country Trailhead signs to the trailhead and High Rollways Observation Deck. Don’t Miss: Get homemade cider and fresh donuts then pick pumpkins at Pahl’s Country Store. A $4 entrance fee includes hay and straw mazes. Say hey to friendly farm animals (shoutout to Penelope the pygmy goat). Wagon rides and barrel train rides are offered on weekends (11168 M-37, Buckley). Get There: From Boyne Falls, head north on US-131 to Sheridan Road, about 14.5 miles. Turn right. Sheridan Road dead-ends at Howard Street. Turn left and head into downtown Petoskey. Don’t Miss: Satisfy your sweet tooth at Johan’s Pastry Shop with giant apple fritters, or if you get there early, their glazed or cinnamon-and-sugared pumpkin doughnuts. Then stop by Somebody’s Gallery and browse works by various Michigan artists, including jewelry, paintings, furniture, sculptures, and more. 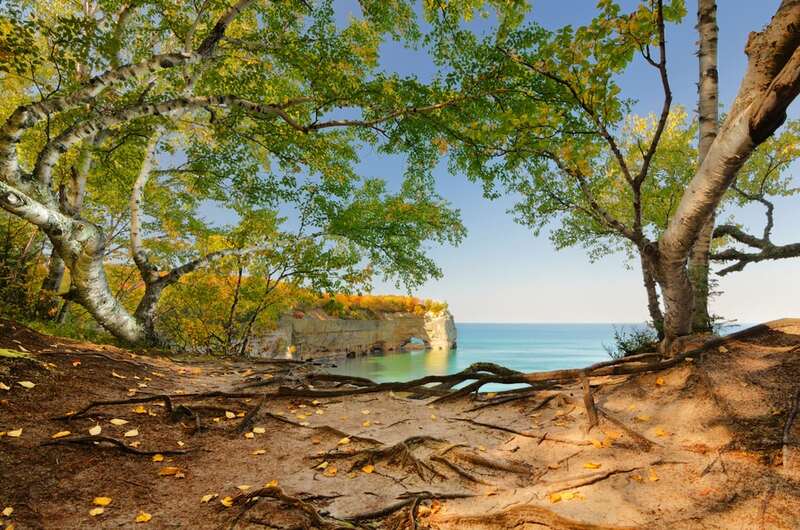 Don’t Miss: Glen Arbor has several galleries featuring Michigan artists. 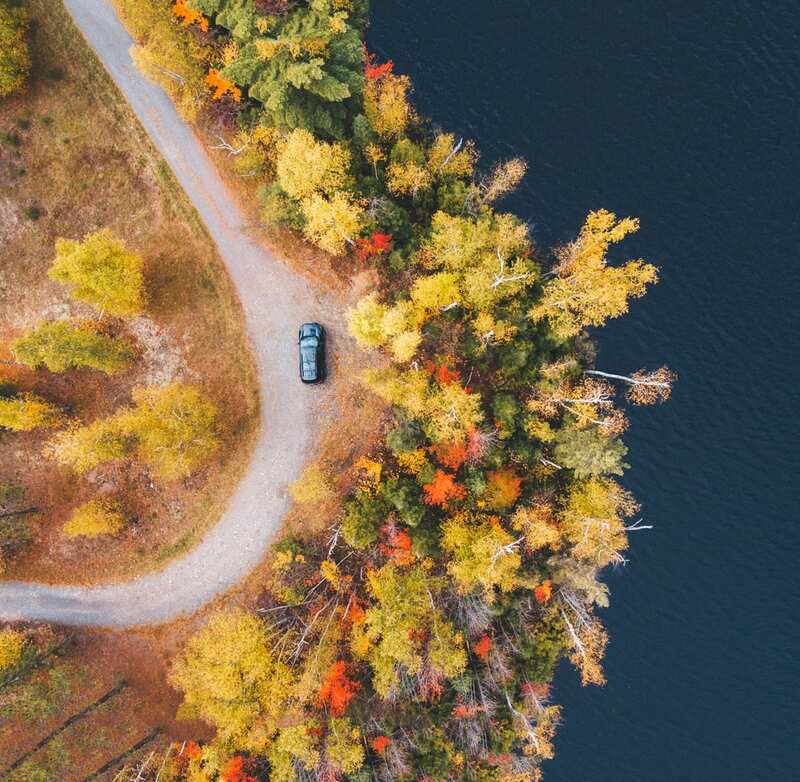 Park the car downtown and walk to Synchronicity Gallery, Ruth Conklin Gallery, Glen Arbor Artisans, Glen Lake Artists Gallery, and Forest Gallery. At Cottage Book Shop, a darling log cabin, you’ll find posters of iconic places within Sleeping Bear Dunes National Lakeshore—they look beautiful framed. Get There: This is the Landslide Overlook. From Alba, drive west on Alba Highway for about 1 mile and turn right on Harvey Road. Follow the overlook signs for 2 miles to the end of Harvey Road. It’s also a stop on the Jordan River Pathway loop, which is popular among backpackers. Don’t Miss: The Pigeon River Country State Forest near Gaylord is home to the second largest free-ranging elk herd in the Midwest. The best time to visit is September and October during mating season. Elk viewing has become popular, so visit during the week if possible. The best viewing is done from your car—don’t forget binoculars. Three places to go: On Fontinalis Road about 3 miles north of Sturgeon Valley Road you will find a small cleared parking area and field; the DNR-signed elk-viewing area on East Sturgeon Valley Road, about 8 miles east of Vanderbilt; less than 1 mile north of the Osmun Road and Clark Bridge Road intersection. If you don’t see an elk in the wild, go to Gaylord City’s Elk Park. Currently, about 70 elk can be viewed near the Elks Lodge off Grandview Boulevard. Get There: From the intersection on M-72 and M-22 in Empire, head north on M-22 for about a mile. The parking area is located on the left just south of the creek. Hike the 1.5-mile trail on easy terrain. Don’t Miss: Explore downtown Empire. Sleeping Bear Gallery features a variety of mediums—metal, wood, glass, painting, sculptures, photography—and is open through October. Across the street, The Misers’ Hoard has an enticing mix of old and new decor—plan on spending some time here. Shipwreck Cafe serves breakfast wraps and hearty sandwiches on delectable pretzel or herb rolls. A bonus stop, because we couldn’t help ourselves. Photo by John Hill. Get There: About 30 miles west of Ishpeming and 43 miles from Marquette, Ruth Lake is located right off US-41/M-28 in Three Lakes. Pull over at the Ruth Lake Picnic Area. Don’t Miss: Head into Ishpeming and delve into the local culture of Yooperism at Da Yoopers Tourist Trap. Home of “Gus,” the largest working chainsaw in the world, and “Big Ernie,” the largest working rifle in the world, Da Yoopers has gifts, wacky vehicles, and sculptures made from found objects. Established in 1918, the Marquette Regional History Center is celebrating its 100th birthday. The museum’s permanent collection includes artifacts from the prehistoric copper culture through contemporary times. Admission: adults $7, seniors $6, students $3, children 12 and under $2. Around the corner, the Upper Peninsula Children’s Museum where kids can climb into the stomach and slide down the intestine in The Human Body exhibit, play in an enormous tree, see turtles in The Fantastic Forest, and explore an archaeological dig site in the Wunderground. Admission: adults and children ages 2–17 $6, children 1 and under free, families with 10 members or fewer $25. Love Michigan? Subscribe to the Getting Up North newsletter for insider vacation tips. Carly Simpson is web editor of MyNorth.com and Traverse Magazine. 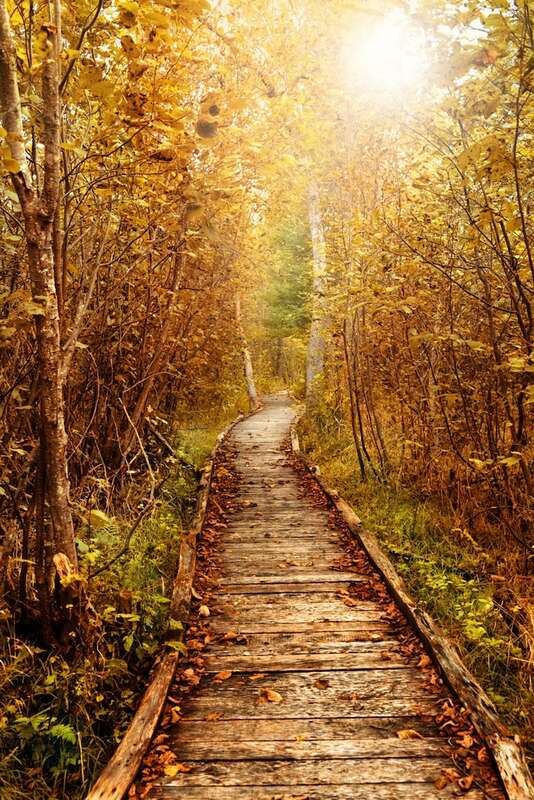 // Heather Higham is a landscape & portrait photographer based in beautiful Traverse City. // John Hill is an adventure photographer that strives to inspire people to experience the beauty of Michigan for themselves.